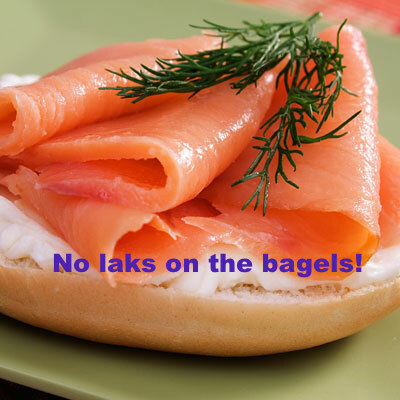 No Lox on the Bagels! Yes, when I was a young, newly honed Jewess, I had the chutzpah to make a sign for a festive brunch I was serving that said just that: No Lox on the Bagels! Little did I know then that depriving the bagel of its “lox” is akin to denying a kid candy at a bar or bat mitzvah, or holding back the Manischewitz at a bris (circumcision). Ouch. When my ex-husband and I were young, and he was opening his first tax-office, I was in charge of preparing the food for the open house. The proud Norwegian hostess with the mostest that I am, some chips in a bowl with salsa wasn’t going to do the trick. I planned carefully ahead and used the requisite 48 hours in advance of the event to cure my own gravlaks, the delicious dill cured salmon that is, of course, a million times fresher, tastier and less salty that its popularized cousin “lox” aka smoked salmon. There was champagne, beer and Aquavit served, as well as homemade cakes and coffee. The gravlaks was elegantly presented on a platter, with dill and lemon wedges, and mustard dill sauce on the side in a small Norwegian pewter bowl we had gotten as a wedding gift just a year or two before. To go with the gravlaks was a cold potato salad and scrambled eggs. The bagels and cream cheese somehow ambushed the party. I don’t even remember how they got there. But there they were, and I had to do what the only responsible thing was to do. Defend the honor of the gravlaks. Of course, my valiant efforts of culinary segregation and prohibitive signage (there was actually a sign with the photo of a bagel inside a red circle with a red line through it posted next to the gravlaks) became the running joke of the entire event, and the story that survived an otherwise uneventful morning of polite chit chat and comings and goings. Since then, I have to admit, that as my confidence has increased in all matters of life, love and letting go, I too, occasionally, put gravlaks on a bagel, schmeared with cream cheese, topped with red onions and capers. And boy is it delicious. Home as in Norway, that is. As social media is heating up with news and discussions about the planned “Ring of Peace” outside the synagogue in Oslo on Saturday, and about the young Muslims who stand behind the seemingly positive initiative, as a Norwegian Jew I’ve had a strange day filled with many mixed feelings. But most of alI I just want to go home to Oslo and show support. Support the synagogue by showing up for Shabbat services and not let the heightened threat of terror win. Support the initiative by the Muslim youth who with their symbolic act say “If Muslims want to act with violence, they have to break through us first” as they create human shields to protect their Abrahamic brothers against hatred and violence. It started early this morning when I was still unaware of the planned event, just the heightened tension and security measures in our Oslo shul. I started up my computer, and as usual expect to first find emails from overseas (Norway, France or Israel, my three overseas main connections) since their day already is half over by the time we wake up in the U.S. In my inbox were two letters to the members from the president of the synagogue in Oslo, Ervin Kohn. In the first, he calmly and like the loving head of a household tells the community to come together and be strong; to be brave and come to services on Shabbat despite the natural urge to huddle at home out of danger’s perceived way; to let members know there would be a warm and comforting lunch served for those who come, so that everyone can gather after services and share a meal at this emotionally laden time. That’s when I felt the first lump in my throat. How I’d love to be there with everyone. Thinking about my fellow Jews in Norway and what it must feel like to be there right now, that’s when I felt the second lump in my throat. And that’s when I began to cry. I cried because lately I haven’t felt like going home. I cried because I have been thinking about where I’d like to be buried when I die, and “in Norway” used to be my natural response to that, but lately, with all the depressing news around what is happening to Jewish communities in Europe, I’ve thought it would be better to find a suitable place in Israel. However, today, as I have read hundreds of comments on Norwegian social media by people of diverse backgrounds that express hope, courage, solidarity and call for dialogue and bridge-building rather than hate-speech and finger-pointing, I have second thoughts. Perhaps it is important after all that when I’m gone, even if I wasn’t always there when I lived, there’s another stone that says a Norwegian Jewess is buried here. I was here. Norway was my country, and I witnessed this time. I wasn’t born with a silver spoon in my mouth, but today I began my day with one. And I like it. Why not begin every day like this, I asked myself as I loaded the dishwasher after breakfast. I can thank my now retired hard working career woman of a mother for enabling me with this delightful early morning experience of luxury; both enjoying my oatmeal on a regular weekday with a silver spoon, and then the freedom to put it in the dishwasher. It’s not that she bequeathed me a trust fund from her earnings, nor did she suggest I never work a day for the rest of my life, as the idiom might suggest; if anything, it is from her that I have learned the value of structure, discipline and persistent effort in all of life’s undertakings, whether great or small, intimate or public. Not to mention the importance of a resilient attitude through all the requisite ups and downs. But she (as well as my dad) did lead by example and say with so many words: Life is short, enjoy it and all you have while you can. Use your beautiful, luxurious silverware every day, and why fret and make more housework for yourself than necessary: run it in the dishwasher. While it’s being washed, go out for a walk in the park instead, smell the roses. Write your blog. One of our few family heirlooms, my grandmother’s pure sterling silver ware has intricate curlicue carved handles inspired by the traditional rosemaling or rose painting pattern of the Telemark region in Norway (as seen below). To give an idea of its preciousness today, one table spoon is about $150; a dinner knife, $200. So for a wedding gift, you might get one knife. I inherited place settings for 8 people, including many serving pieces. Lucky me. It was around the time of my parents’ divorce when my mom was moving to a smaller apartment and was about to retire, that I noticed her silver ware had also moved from the “special” drawer in the dining room breakfront where it had been wrapped in plastic bags and felt pouches to prevent tarnishing, to being casually placed and exposed to oxygen in her kitchen drawer. While in Oslo for a visit, she served me dinner on my day of arrival, a weekday meal of fishcakes, carrots and potatoes, using her silver. “Wow, mamma, what’s the occasion?” I asked with a wink, thinking my visit, as marked by the Norwegian flag waving form her 3rd floor balcony, might be the catalyst for the fancy cutlery. “Oh that. I’ve decided, why not enjoy it every day?” Bringing a glistening carrot neatly pierced on the tines of the Telemark silver fork to her mouth, she gave a slight shrug with her upper body suggesting she felt justified and had mostly come to terms with her own “transgression,” as if she was responding to the ghosts of generations of raised eyebrows questioning her on this and her other radical indiscretions when it comes to tradition. She might have said “Every day is a celebration! I am letting go!” but this exuberance was left for me to write later. However, it came from her. My mother. If you are of Norwegian stock, you may have groaned in disapproval (or heard your mother in the recesses of your mind) at the mention of the silverware in the dishwasher. This is one of the great cultural taboos, suggesting perhaps my utter lack of respect for safeguarding the traditional handling of the family jewels by hand washing them. Alas, as the VikingJewess of perpetual cultural and traditional in-betweenness that I am, it is possible I have lost some of my touch with, or reverence for, one tradition as I have been hard at work learning about and safeguarding the other. While both my born Norwegian heritage and my adopted Jewish one deeply move and inspire me, I have also come to realize that life is too short to do anything to perfection. And what is that anyway, perfection? Imperfection summons curiosity and inquiry; the story is found in the flaws, lodged in there like a gift to be unwrapped and enjoyed.